Herein, we report the synthesis of two phenylaza-crown-6 lariat ethers with a coumarin fluorophore (1 and 2) and we reveal that compound 1 is an excellent probe for K+ ions under simulated physiological conditions. The presence of a 2-methoxyethoxy lariat group at the ortho position of the anilino moiety is crucial to the substantially increased stability of compounds 1 and 2 over their lariat-free phenylaza-crown-6 ether analogues. Probe 1 shows a high K+/Na+ selectivity and a 2.5-fold fluorescence enhancement was observed in the presence of 100 mm K+ ions. 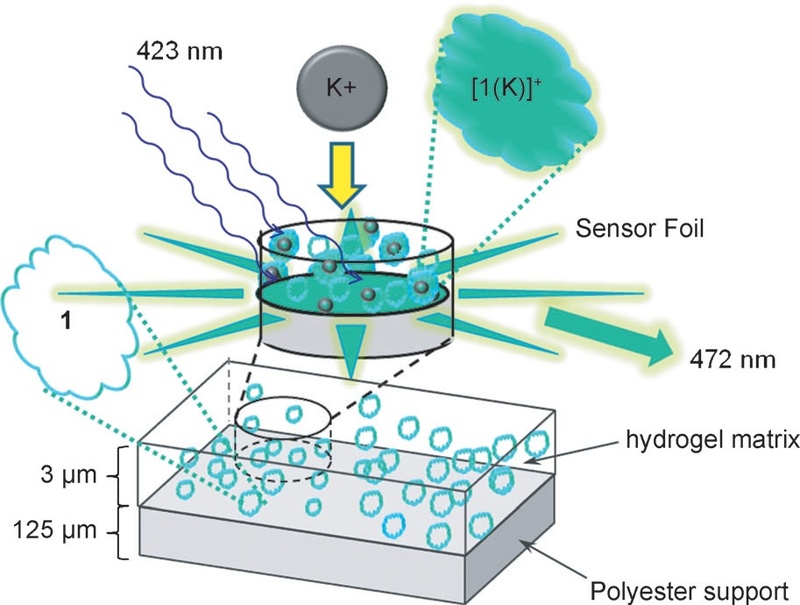 A fluorescent membrane sensor, which was prepared by incorporating probe 1 into a hydrogel, showed a fully reversible response, a response time of 150 s, and a signal change of 7.8 % per 1 mm K+ within the range 1–10 mm K+. The membrane was easily fabricated (only a single sensing layer on a solid polyester support), yet no leaching was observed. Moreover, compound 1 rapidly permeated into cells, was cytocompatible, and was suitable for the fluorescent imaging of K+ ions on both the extracellular and intracellular levels.